A carved pumpkin on a front stoop in Darien gives a nod to the recent power outages. 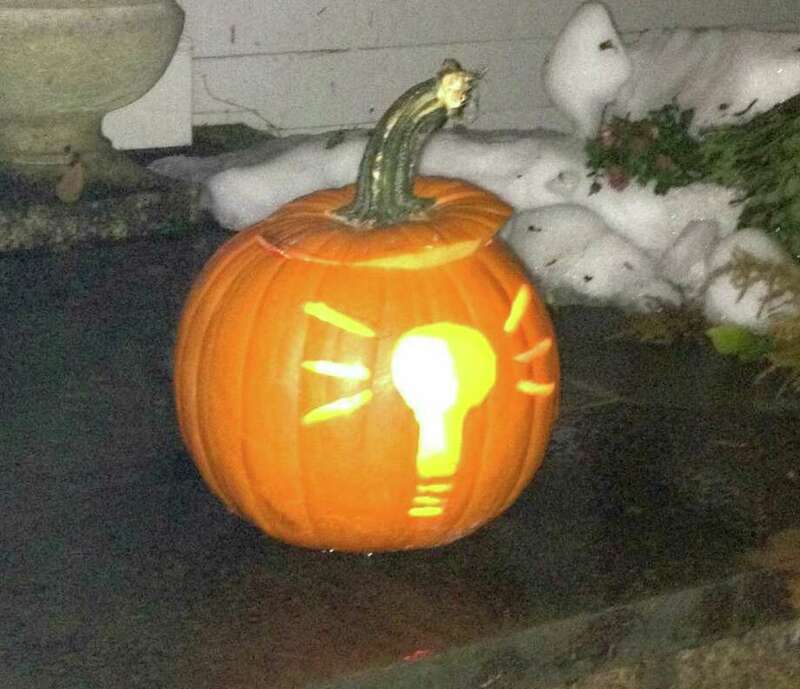 Andrea Cragin and her family in Darien combined current events and the fun of pumpkin carving when they carved a lightbulb design into a pumpkin. Many homes in Darien lost power after this weekend's snowstorm. Some in town made the best of it by entertaining themselves. There is still an ongoing cleanup effort and Gov. Dannel Malloy has spoken about the state's response to the storm. "I want everyone to understand that our number one priority is getting power restored to people in the state of Connecticut," Malloy said. "Let's put it this way: We have been disappointed in the response from outside the region and specifically the Department of Energy has been asked to intercede and to make sure more assets are on their way." Hundreds of crews from the state's utility companies continue to repair downed power lines and blown transformers left behind by the unusual winter storm that struck Saturday into Sunday, dropping more than a foot of snow in many areas of the state, causing more than 800,000 power outages at its peak. Connecticut Light & Power has knocked its power outage total down to just over 684,000 by 8 a.m. Tuesday. As of 4 p.m. Tuesday, most of the power outages in Darien had been restored with 302 Connecticut Light & Power customers out of a local total of 7,858 still without service. As CL&P evaluates the damage done by the storm, the company has started to release estimated restoration times for specific towns. Danbury, with 17,013 (48 percent) of CL&P customers still without power Tuesday, is not expected to have 99 percent restoration until Sunday. New Canaan, New Milford, Norwalk and Westport should have power back Friday, while some Darien residents will have to wait until Thursday. Estimates for every town have not yet been released, but will be available by Wednesday. "We're here to serve customers and to have a large amount of customers out for an extended period of time is frustrating for us as well," said CL&P President and Chief Operating Officer Jeff Butler during a Tuesday morning news conference in Hartford. "We're doing everything possible to get our customers restored as quickly as possible."